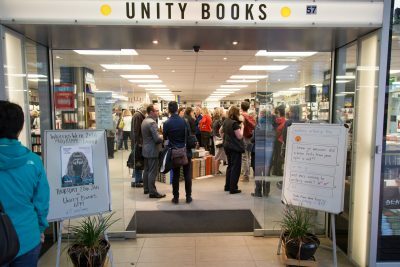 Books, people, ideas and a strong sense of community are at the heart of Unity Books in Wellington, writes co-owner and manager Tilly Lloyd. I doubt many Australian sports people, let alone booksellers and publishers, will remember the 1954 New Zealand soccer team, who won against the Australian Eleven, or more pertinently, the only sober person in the NZ team. Philosophy student and accounts manager Alan Preston was there under the influence of Sarsaparilla, and when he returned to Wellington he decided that one day he would have a crack at the commercial end of philosophy. In 1967 he opened his literary independent, Unity Books, and stuffed it to the gunnels with upbeat books, and all of them were parallel imported. This was not because he was a radical; he just wanted to get on with the expounding and selling. Expound he did. And over the years, many of his staff did as well, among us authors, musicians, thespians, artists and film freaks, willing to venture an opinion on whether Franzen is allowed to have a dud, or on mixing desks, politics, land-values or amazon (lower case please). Alan died in 2004, as intellectually dynamic as ever, and blissfully unaware of the kindle. In 2005 Jo McColl and her husband Lawrie McColl, owners of Unity Books Auckland, came in halves with me on the Wellington shop. Across the decade since, Borders went down the over-leveraging gurgler, NZ became too small for Leading Edge, ebooks became merely a format, localist websites got gruntier, and, in this start-up world, venerable indies run by the now-retiring baby-boomers became hard to sell. Around then, Unity expanded. The response was hearteningly enthusiastic. The customers bring us huge vigour, and some of it is turnover. And some of it is home-baking, like when we had the flood last year. All that public traffic and community over 48 years and the luck of our mass-media relationships has built a strong public personality, which we do our best to look after. We take Vitamin U. We thank our lucky stars. We advertise too. Beyond feeding the hungry beast of social media, we still get results from our ads in analogue print media. And to keep a foot in all camps, over the past six months we’ve been sponsoring the book pages of a brilliant online journalism site called the Spinoff. But Unity is just like all other bookshops, hammering away at the basics. Pardon this list, they all seem equally critical: sourcing, special orders, web supply, library supply, incoming and returns, display change-outs, IT, newsletters, 66 shop events a year, fortnightly reviews on Radio NZ and Newstalk ZB, reps, in-house graphics, running Writers Week across 12 sites, and accounts. These basics always run permanently beneath, like good joists under a good floor. Beyond all that, we also get to handle wild (and calm) new books in our hands every day. Nothing is more recharging. It helps that we read constantly, regardless of fashion, regardless of source. It helps that Australia’s copyright law enhances the NZ market. It helps that our buyers find the sweet spots so often. Laughing helps. Expounding helps. And an occasional bottle near the end of trade does too. Collegially, we’re aligned with Wellington’s indie and Paper Plus bookshops on several projects to protect street culture, for example, the Wellington bookshop street map. As far as we’re concerned, if it’s street culture, it matters. We all send customers to neighbouring bookshops (in a spirit of co-opetition). We’re alongside Booksellers NZ’s lobby to bring in GST on amazon imports. We’re alongside the NZ ebility users group. We believe in collectivity and we find strength in our pared-back book industry (we practising optimists who keep the recessional survival kit in handy reach). And whenever that next recession might be, part of the Unity survival kit—it’ll be 49 Unity-years in September—is our determination that Unity continues as a viable forum for books, people and ideas. I know this sounds a bit cranked up for a mere shop, but on top of all our commercial activity we booksellers do carry a light-shedding responsibility, and it works across all the people making and using the place. Unity has been a place of great personal learning for me since 1975 when I started going there on Friday nights. This light is what Alan Preston wanted. Our bookshop can have all the Te Reo signage and comfortable fake Bauhaus armchairs in the world but they mean nothing much without ignition and depth in the stockholding, or a considerable ability to serve with brains and warmth. It’s in our books and it’s in the Unity people who work here—29 of us during festivals, 18 usually—who keep the old values fanned, and direct a small human beam on the new stuff. The Invisible Mile (David Coventry, Victoria University Press).